Located only a few metres from the beach, the Paradise Bay Resort Hotel is truly a paradise on earth! The Eco-Hotel welcomes you to its 240 guestrooms including eight comfortable junior suites spread across five floors. Being next to the beach, the conditions are ideal to have some great fun in the sun sand and sea! The hotel also features a sandy private beach, a beautiful terrace, lush gardens and some fabulous restaurants. The hotel also features four sea-water swimming pools of which one is a kid’s pool. There’s also tennis courts, scuba diving and plenty of water-sports that you can try out. 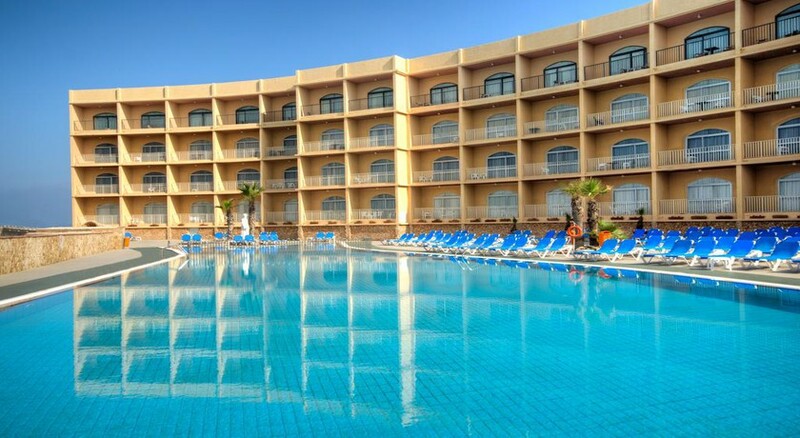 Paradise Bay Resort Hotel is located in the north of the island of Malta. It is not far to the islands of Comino and Gozo. The beach is about 200m from the hotel’s doorstep. 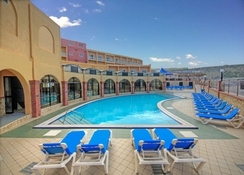 The Malta International Airport is 28.7km from the hotel. The 240 guestrooms are immaculately designed using only natural substances. 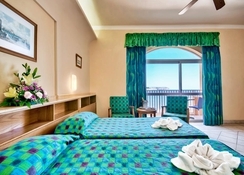 With the air conditioning, central heating and the fan your room is always well tempered. The bathroom has a luxurious spa bath, a large bath and a shower. Bathroom amenities also include a hair dryer. There is a TV and a radio in the room. There is also an in-room safe and a well-stocked minibar. You can choose to have a full-size refrigerator or a small refrigerator and a tea & coffee maker in your room. The Paradise Bay Resort Hotel in Cirkewwa features two amazing restaurants, a lounge and two bars. The restaurants serve local and European cuisine. The service team at the hotel spoils you with culinary delights including a buffet breakfast, lunch buffet and evening buffet. The bars are the perfect place to unwind after a long and tiring day at the beach or with site-seeing. These bars have a wide selection of beverages, wines, spirits and beers. Hotel activities include golf, tennis, horseback riding and archery. On the beach, the offer includes water sports, water skiing, windsurfing, diving, motor boating, pedal boating and canoeing. There is also table tennis and bocce. If you like sports, you can try your hand at beach volleyball. You can also try water aerobics at the hotel. The hotel provides comfortable sun loungers, parasols and towels. There’s also live music programs as evening entertainment. Children too can have their share of fun at the hotel, thanks to the kid’s club and playground. Treat yourself to pure relaxation in the hot sauna during your stay. Enjoy relaxing moments in the luxurious Jacuzzi or the indoor swimming pool. The room had fantastic sea view and balcony . The room was cleaned daily and breakfast was amazing . We also had a kettle and a small fridge in our room and tea was provided.